He was a loyal and wonderful companion and tireless worker for the Beatles. Their nickname for him was "Mr. Fix-It." Whatever the Beatles needed or wanted individually or collectively - he arranged. With superb professionalism - and utter discretion. In the years after the Beatles he wrote several books, gave countless media interviews and spoke at numerous Beatles fan conventions. He never said even one ill word of his employers. He only ever celebrated their music, life and spirit. He was as generous speaking to individual fans in convention corridors as he was speaking to thousands from a big stage. His heart was huge and his love for Brian Epstein, the Beatles and their fans was endless. He died peacefully in his sleep on the morning of Wednesday 9th June 2004 - after a short bronchial illness. Mercifully he suffered no pain. His planned activity for the day had been to videotape a reminiscence of Brian Epstein to be shown at an upcoming tribute to the Beatles' manager in San Francisco. Typical of Alistair - he was always giving to others. His entire life was about giving. And most of all in recent years - he gave to us fans. He is survived by Lesley - his wife of 45 years. They had no children. Lesley is not online and cannot receive email or view websites. However if you wish to express your condolences to Lesley and let her know how much you cared for Alistair - you may do so by sending an email to this address - and your message will be printed and delivered to her. Rest In Peace dear Alistair. Thank you for your generous service to Brian and the Beatles. And thank you for being such a wonderful friend to all of us fans. 5 de setembro de 1966. 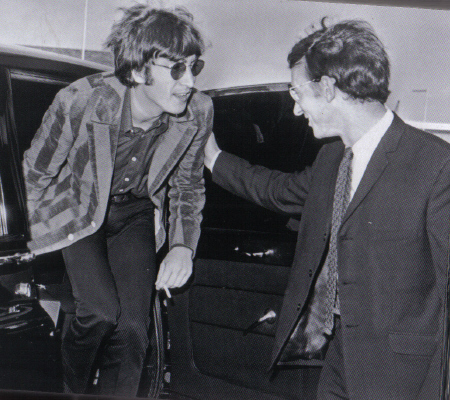 John Lennon e o assistente Alistair Taylor chegam ao Aeroporto Heathrow; Lennon embarcará para a Alemanha onde filmará "How I Won the War".